HOT pink rose petals sprinkled across creme laced tables overlooking the turquoise Caribbean Sea on the island of Barbados. This was how I’d always envisioned my wedding reception to be. My matrilineal Bajan ancestry combined with a love for all things Black, cultured and international, led me to believe with full certainty that whenever my wedding day came, it would be caressed by the tropical sea breezes of beautiful Barbados. Still, life whisked me away from my Barbadian plans and sailed me in a much more southerly direction… to meet and marry my husband on the great continent of Africa. Looking back, the months leading up to my wedding day in rural northern Namibia were an immense ball of nerves. I was an African American marrying into Namibia’s largest tribe and on their turf. Basic unfamiliarities with the country’s wedding scene as well as my husband’s tribal traditions left me feeling a significant amount of uncertainty about my wedding. As the bride, there were many times that I felt out of control and out of my element. As if I was a spectator in my own wedding. The gray areas began with the planning of the wedding itself. My initial efforts to find a wedding planner proved obsolete. Many of the “higher end” planners and photographers were primarily focused on weddings based in Windhoek, Namibia’s capital city. They demanded additional fees for transportation and accommodation to attend our rural wedding as it would be held eight hours north of Windhoek. After weeding out a few bad apples, my husband suggested an event planner he’d heard about through the grapevine. The planner was a stout man and former radio DJ from my husband’s tribe. His event planning company was based in the same part of the country that our wedding would be held in. Upon meeting him my initial impression was that while a bit brash he was sharp and straight to the point. He was definitely the opposite of the flowery feminine wedding planner I’d always envisioned myself having. When I showed him a sample of my salmon pink color scheme he yelled out for his assistant to bring in a few color palettes. He continued on with a series of decor and menu related questions for me to answer. Meanwhile, I was still confused about how many guests we were actually planning for. My husband explained to me that the nature of weddings in his tribe was very much, come one, come all. Anyone in the area could stop by and their friends could too. This only intensified my anxieties. What if we overestimated and then had a bunch of empty tables? The numbers game was not working for me. Probably sensing that as a foreign bride I was out of my comfort zone as it related to the structure of Owambo tribal weddings, the planner and my husband took the reigns and settled most of the details. When my wedding day came and I walked into my reception tent, I couldn’t hold back the tears. I was so pleased with how our wedding planner had taken my direction and designed our guest tents. From the inclusion of traditional and vegetarian dinner options to the overall decor, it was the perfect Owambo American blend. He’d combined my ideas with the local tradition beautifully. There were also so many guests that people had to be turned away from the main tent! We’d also decided to use the photographer who was included in the planner’s package. He too was a part of my husband’s tribe, and so given his familiarity and comfort with Owambo weddings, he seamlessly blended into the wedding. This was a big lesson for me on the importance of supporting Black business. I truly did not need to go with the "fancier" wedding planners or photographers from Namibia’s capital city. Supporting locals from the more rural part of the country completely worked in my favor, particularly with incorporating and understanding the tribal aspects of our wedding day. You can reach Remind Trading, the Black owned event management company that planned our wedding, here. The geographical location of my wedding also played a major role in limiting my wedding day options. In Okahao, the town where we married, there are no spas for pre-wedding glamour, no high end make-up artists and no natural hair stylists. All of the extravagancies that I grew up expecting to have in the days leading up to my wedding were barely an option. This stressed me out. Once I wrapped my mind around the fact that I wasn’t going to find my glam squad in small town Namibia, the first thing I did was research bridal looks and tutorials on Pinterest and Youtube. I also made a pre-wedding visit home to New York where I had a few make-up artists demonstrate and write down wedding looks that I tried my best to emulate the morning of my wedding day. I put my hair up in a Marley hair bun and walked down the aisle. I think I did a pretty decent job! The other challenge was that because I was marrying all the way in Namibia, most of my friends and family from the States could not make it to the wedding. The required time off from work, distance and cost of traveling made attending my international wedding a huge commitment that most people couldn’t afford to make. My guests from the States amounted to exactly three people: my father, my best friend and her mother. They flew down together from New York City. A wonderful family friend based in Lesotho also traveled to Namibia to attend. On one hand it was admittedly a bit depressing to realize just how few American guests I’d be hosting. On the other hand, hosting and entertaining people from abroad for two and half weeks takes a lot of planning and work, so in the end I was happy it was only those three. Also, at this point, I’d been living in Namibia for almost four years. Most of my friends were actually already here in Namibia!I realized that I had really carved out a life and social network for myself, so my Namibian friends' attendance was more than adequate. You know how in the States weddings are so focused on the couple and particularly the bride? Well, I got the shock of my life when I learned that my husband and I would be sharing our church with not one, not two, but three other couples. And our wedding ceremonies wouldn’t be sequential, they’d be simultaneous. I had heard about this scenario but truly never thought it would be my situation. 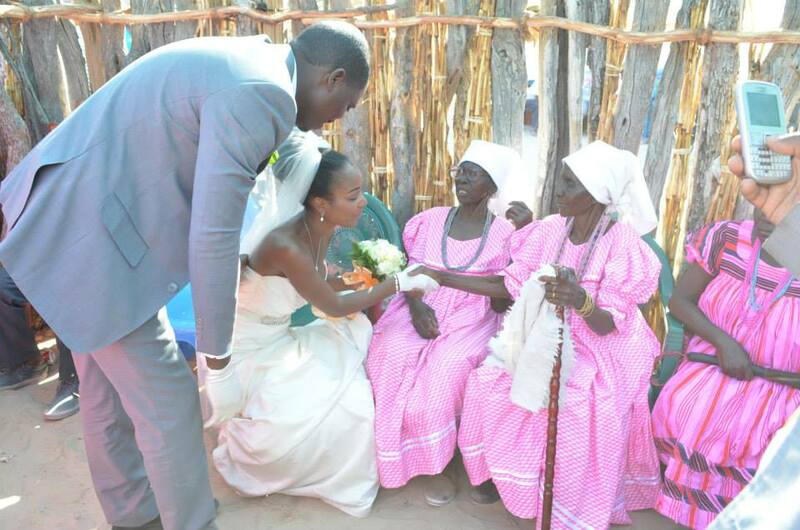 It happens because a large number of Namibians either marry in August, September or December. These are Namibia’s main wedding seasons. Weather and school or holiday vacations make these the ideal times of year to marry in Namibia. Yet the limited number of churches available in northern Namibia means sometimes couples have to share the church. My husband and I chose to get married in early September because the weather wouldn’t be that hot. This was ideal for myself and any Americans in attendance who most certainly would not be able to handle a long wedding at the height of Namibia’s summer season. While disappointed, I had no choice but to share our wedding vows with the other three couples who’d also chosen to wed on September 6th, 2014. Despite this bridezilla bummer, the pulpit sharing went surprisingly smooth. The other three couples and my husband and I sat side by side sharing the stage and no one couple outshone the other. I also had an amazing pastor who offered to do the service in English and Oshiwambo, so that my American guests and I could follow along. It was a really huge lesson in humility and any bridal narcissism I had gone out the window. To add on to the ambiguity of the day were the inevitable traditional aspects of my wedding. I’d attended Owambo weddings in the past and so I had a rough idea of what took place. Aside from the church service and reception, there was the procession out of the church, the welcoming into the home, a gift-bearing ceremony, and greeting the elders among other intricate affairs. My understanding of how the day’s activities would flow was definitely at a starter level so I just followed everyone’s lead. Thankfully my husband, his relatives, and my bridesmaids guided me through the various traditional aspects of the wedding and it flowed rather seamlessly. Did everything run perfectly on our wedding day? Definitely not. For some reason, the ceiling of our main wedding tent had a yellow curtain draped across it rather than the all creme look I thought I’d requested. It would’ve been nice to have had someone fussing over my hair, nails, and makeup instead of me doing it myself. The one time I had to urinate meant squeezing into a porta-potty in all my poofy wedding gown glory. And my dream wedding of jumping the broom while overlooking the blue-green waters of the Caribbean Sea definitely would’ve been exquisite and a lot easier to maneuver through. But so much more than my material desires manifested. An exceptionally strong wind blew throughout the morning of my wedding, noticeable as the preceding days had all been significantly calmer. I like to think of this as the spirits of my late mother and father-in-law, boldly making their attendance known. Throughout the day the women in my husband’s tribe continually serenaded my husband and I in their traditional ululation, making me feel like an empress and warmly welcoming me into their tribe. And two Black cultures, became one, giving reason for the ancestors to rejoice in adulation. By the end of the day, everything that appeared to be struggle, yielded so much reward, and I couldn’t have asked for a better passageway into marriage. You can watch parts one and two of my wedding below!